The job of enabling learning happens at the middle level. She pointed out that middle level leaders have huge power because the day to day classroom activities, the curriculum planning and the assessment mostly rest with these people. We started the day with a discussion about our biggest concerns associated with our leadership role. I'm sure she hears the same issues at every school she visits, such as the problems of micromanagement and defining our parameters of power, the conflict we experience between inspiring teachers and managing them, personal v- professional relationships and in particular in international schools the transient nature of teams and how recruitment can seriously affect group dynamics. As I was reading further around the subject of leadership I came across an interesting article from the Economist from last year. 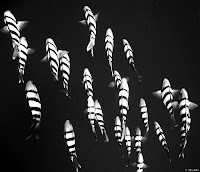 This article was looking at collective behaviour and quoted a study by Dr Iain Couzin of Princeton University who has discovered that leadership (in fish) is extremely efficient: the larger a shoal, the smaller the proportion of it that needs to know what is actually going on. He claims that having too many leaders results in confusion - which often applies to humans too - how often have we been in situations where we've heard the expression "too many chiefs and not enough indians"? In a couple of places where I've worked employees were completely mystified by (or resentful of) what the leaders actually did with their time each day - this was not simply the result of a lack of communication but also a perceived sense of inefficiency or even incompetence - and I've noticed this attitude seems pervasive in places that are very "top heavy". Dr Couzin also noticed that the best outcome for the group seems to depend on most members being unaware and simply taking their cues from others. He has found this phenomenon applies to all sorts of different situations, including voters in a democracy. In fact he writes that a group's "intelligence" depends in part on its members' ignorance - which I find rather worrying! The Economist article however questions some of Dr Couzin's findings. It asks: what happens in organizations where ignorance is not bliss - where in fact the leaders themselves turn out to be sharks? 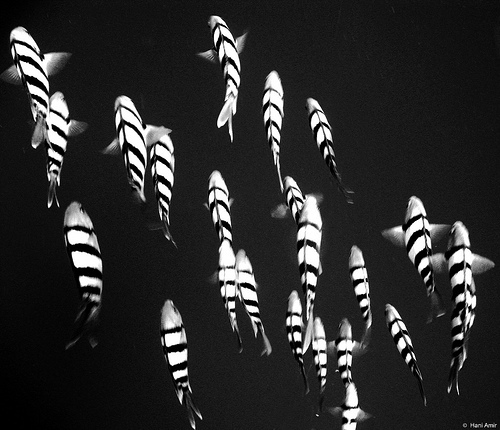 If you take a careful look at a school of sardines, you'll notice that although the fish all appear to be swimming in the same direction, in reality, at any time, there will be a small group of sardines swimming in a different direction, in an opposite direction, against the flow, against conventional wisdom. And as they swim in another direction, they cause conflict, they cause friction, and they causes discomfort for the rest of the school. But finally, when a critical mass of truly committed sardines is reached - not a huge number like 50 percent or 80 percent of the school, but 15 to 20 percent who are truly committed to a new direction - the rest of the school suddenly turns and goes with them - almost instantaneously! Seth Godin writes about "leadership and followership". He writes about becoming a leader: "You don't do followership for years and then someone anoints you and says "here". In fact it's a gradual process, one where you take responsibility years before you are given authority." I think if you want to become a visionary leader, it can be good to spend some time as a "committed sardine" rather than a "shark". I am fond of analogies and I liked this one a lot! I think that the conflict, friction and discomfort we, as conforming swimmers, feel is a healthy reminder to take the time to see where the others are going. At first all change feels unnatural. It takes a lot of courage to swim upstream (and sometimes even more to turn back around if the going gets too tough) but the rewards can be very gratifying. Thanks for the post.